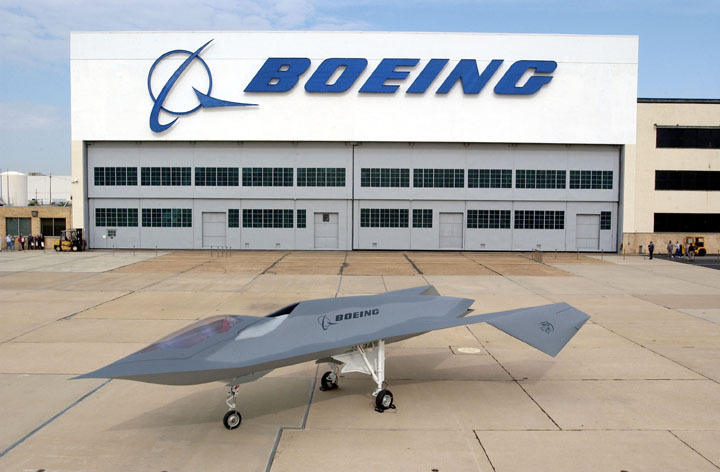 On October 18, 2002, Boeing declassified its secret Bird of Prey during a rollout ceremony at the company’s facility in St. Louis. Named for a spaceship in the science fiction television series Star Trek, this technology demonstrator pioneered revolutionary advances in low-observable (stealth) features, tailless aircraft design, and rapid prototyping techniques. Built by the famous Phantom Works, the advanced research-and-development division of McDonnell Douglas, the Bird of Prey incorporated many new innovative concepts to reduce radar, infrared and visual signatures. After McDonnell Douglas merged with Boeing on August 1, 1997, Boeing continued the development of the aircraft and fully funded it. The cost of the program was somewhere around $67 million. The airplane incorporated many new innovative concepts to reduce radar, infrared and visual signatures. Designed to represent a platform that would fly operationally during the daytime, it featured exterior markings that blended with the sky and reduced telltale shadows from components such as the engine inlet. Bird of Prey was among the first aircraft to incorporate large single-piece composite structures, low-cost disposable tooling, and three-dimensional virtual-reality design and assembly processes to ensure affordability and high performance. The Phantom Works conceived Bird of Prey as a way to provide state-of-the-art technology demonstration at the lowest possible cost. To save money designers incorporated many off-the-shelf components, which resulted in significant consequences during the course of the test program. The Bird of Prey was powered by a Pratt & Whitney JT15D-5C turbofan engine, the same used for the Cessna Citation business jet and the main landing gear included modified components from Beech King Air and Queen Air twin-prop commuter aircraft. The pilot’s ejection seat and the emergency landing gear blow-down bottle were taken from a McDonnell Douglas AV-8B Harrier, the control stick and throttle were scavenged from an F-18 Hornet and the rudder pedals from an A-4 Skyhawk. With pilot Rudy Haug at the controls, Bird of Prey took to the air for the first time on September 11, 1996 and only 38 missions were flown between 1996 and 1999, roughly one sortie per month. Rudy Haug, the only pilot to ever fly the Bird of Prey, reached during the test flights an operational speed of 260 knots and a maximum operating altitude of 20,000 feet. The Bird of Prey was otherwise key in the development of a new kind of low-visibility camouflage. Areas that are usually lit most brightly (such as the horizontal flat surfaces over the wings and the top of the fuselage) were painted more darkly, and areas that are usually not quite as bright (such as the sides of the fuselage and other more vertical surfaces) were painted a lighter shade of gray. This reduced the overall contrast of the aircraft, making the whole shape appear to be one relatively even shade of gray. This made the Bird of Prey’s features difficult to discern, and made it harder to see against the sky. These low-visibility ideas are currently in use in the F-22 Raptor. The Bird of Prey program provided many unique challenges and valuable lessons applicable to future aircraft test programs. Many of these involved technical issues, but the most important concerned project management practices. After completion of the test program the Bird of Prey was placed in storage, and may have been destined for the scrap yard. Fortunately, however, it was saved for posterity. On July 16, 2003, the Bird of Prey and its cousin, the X-36, both were placed on permanent display at the National Museum of the U.S. Air Force at Wright-Patterson Air Force Base, Ohio. They have been made 46 queries to database.